﻿National Hot Dog Day: Calendar, History, Tweets, Facts, Quotes & Activities. National Hot Dog Day seeks to appreciate hotdogs. 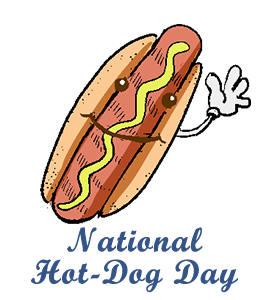 The National Hot Dog and Sausage Council created the National Hot Dog Day to honor the all-American hot dog. The first National Hot Dog Day was held in 1991, where a hot dog luncheon was served on Capitol Hill. Since then, it has become tradition to serve hot dogs to Capitol Hill staffers, lawmakers, agency officials and baseball legends. Frankfurters, which are very similar to hot dogs, originated in Frankfurt, Germany. In the 1880s, Antonoine Feuchtwanger began to sell hot dogs in St. Louis, Missouri. Eventually by the 1890s, it is believed that Chris von der Ahe, a German immigrant who owned the St. Louis Browns, began to sell hotdogs at baseball games. Since then, hotdogs have been deeply rooted in American baseball culture. To honor the association between baseball and hotdogs, the American Meat Institute invites baseball players to attend the annual hotdog luncheon on Capitol Hill during National Hot Dog Day on July 23rd. The record for most hot dogs made in one minute is 11, according to Guinness World Records. It was set by Andre Ortolf in 2016, and equalled by Luke Franks in 2017. According to the National Hot Dog and Sausage Council, the proper etiquette required to eat a hotdog is finish the hot dog in five bites. In the case of a foot-long wiener, only seven bites are appropriate. Across the United States, consumers spent more than $2.5 billion on hot dogs in 2014. Los Angeles residents consume more hotdogs than any other city. In 2014, Los Angeles consumed more than 39 million hotdogs. The Physicians Committee for Responsible Medicine has stated that hotdogs contain carcinogenic (cancer causing) compounds, are high in fat, cholesterol and salt. In fact, a recent study by the Harvard School of Public Health has found that a single daily serving of processed meat can increase the risk of colorectal cancer by 21%. Every year on July 4th, Nathan's Famous Hot Dogs hosts a hot dog eating contest in which contestants must consume as many hot dogs as possible in 10 minutes. The current male record holder ate 69 hot dogs while the female record holder inhaled 45 hot dogs in only 10 minutes. Enjoy a hot dog at one of many traditional hot dog stands in your city to celebrate the National Hot Dog Day. Prepare some sticks, a large bonfire and packages of hot dogs, buns and condiments and get ready to cook hot dogs over the fire. For a healthier alternative to processed meat hot dogs, try a turkey dog, veggie dog or hotdog made from soy. Participate in the Annual New York Hot Dog Challenge. For the challenge, 10 hot dog carts are situated over the 3-5 mile course. The aim is to eat a hot dog with the bun at each cart before proceeding with the run.